The first time I had roasted marshmallow ice cream was from Gregg’s in Toronto. It instantly became my favourite ice cream. 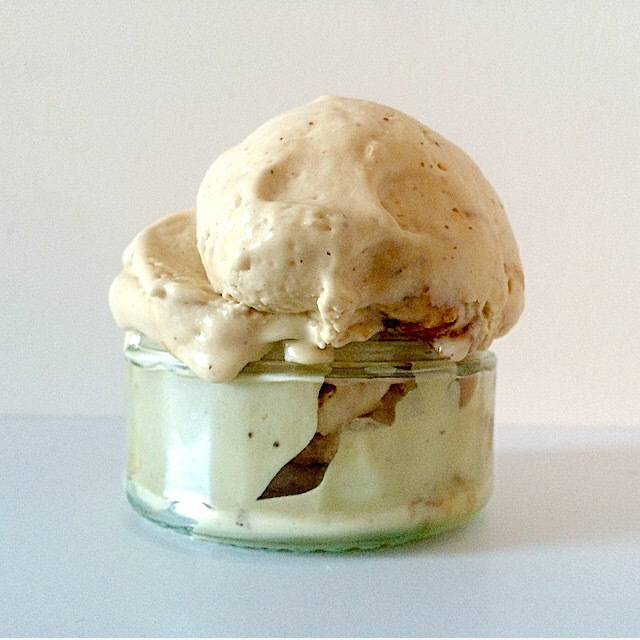 I made this quick no-churn recipe and it is the best toasted marshmallow ice cream I’ve had. It’s smooth and creamy. The texture is perfect and the burnt bits of the marshmallow give it a candy crunch. Line baking sheet with parchment paper and place marshmallows on it. Bake for 10 – 15 minutes, until puffed up to double its size and browned on top. In a large bowl, mix 1/4 of the condensed milk with vanilla. Add the marshmallows and stir with a spoon until the condensed milk is mixed with the marshmallows. It will start to stick together, pour the rest of the condensed milk in the bowl and continue to mix. Break up the big pieces and stir well. Add 1/2 cup of the whipping cream to the bowl. With an electric mixer on low, blend until fully incorporated. Add the rest of the cream to the mix. Mix on high until the cream has soft peaks. Pour into a freezer safe plastic container with a lid. Freeze overnight. The method in the recipe is very important. The first time I tried to make this ice cream it was a disaster. The cream got over-whipped and separated, the marshmallows were sticky and too warm and stuck to everything. It was a mess and a huge fail. The marshmallows have to be warm, but if you add warm marshmallows to whipped cream, the cream deflates, and cold marshmallows are hard so they won’t mix. The solution is to mix the warm marshmallows into the condensed milk and then mix into the cream. Mixing the marshmallows with the condensed milk prevents them from hardening. The heat loosens the condensed milk and you get a thick sauce. By adding a bit of the cold cream to the mix, it breaks up the marshmallows and cools the mix. So when you add the rest of the cream, it incorporates everything beautifully and turns smooth and velvety.